The Harker Conservatory’s 2013-14 fall play, “Anon(ymous),” is loaded. It features an original score created by students, original choreography by students, Balinese shadow puppetry, a Bollywood dance, fog, smoke, lights, and an all-new audience configuration. Then there is the content. “Anon(ymous)” is a new, gritty, mythic exploration into cutting-edge, modern-day political challenges. The piece blends Homer’s “The Odyssey,” the epic read by all Harker freshmen, with the diaspora story of an undocumented immigrant finding his way across America, searching for his identity and his family. “Metamorphoses” featured a pool. “A Christmas Carol” had a live pre-show Dickens Faire. “Anon(ymous)” will split its audience into two and face them against each other across the stage, like fans on two sides of a football field, in a configuration known in the theater world as tennis court-style. Draper named The National Theatre of Scotland’s “Black Watch” and Cirque du Soleil’s “Corteo” as his influences for the new design. In “Black Watch,” which toured the world before finally reaching San Francisco in May of this year, a partitioned audience watched a dozen soldiers race up and down a central runway connecting two structures resembling army bases at either end, acting out the Iraq War and their lives afterward. In “Corteo,” the audience wrapped circularly around a central disk, with exits and entrances also proceeding from two opposing poles. Both productions created immersive experiences that Draper was keen to emulate. On how they found their research for the play, the students were clear: rather than head to the library and search the catalog for critical essays as they might with a classic, they took to Google News and YouTube to develop deeper understandings of the predicaments and lifestyles of their characters. The actors looked into their family histories with immigration and political and personal turmoil. One, whose character in “Anon(ymous)” must be the “man of the family,” told of an ancestor whose father was felled by an earthquake in Japan, leaving him to become that “man of the family.” Another told of a divide in the older generations of his family over allegiances with British prior to the partition of India. Those stories became a pretext to learn about the refugee camps spurred on by the political turmoil. The exercise succeeded in casting the play as a piece of very personal reality for the actors, allowing them to see their characters in the context of their own lives. One student confessed that his heart was not in the play until he sought out his family and heard tales of their past. That made the play personal for him. “The play is resonating with students as I’d hoped it would,” says Draper. In many ways, “Anon(ymous)” is more than just a play, it’s a multidisciplinary theater event. In one love scene, two characters tread water in a sea of fabric. In another moment, moving hoops cascade down the runway to conjure up images of the characters dashing through tunnels. A shadow dance, in the style of Balinese wayang kulit shadow puppetry, tells the story of Anon and his mother. 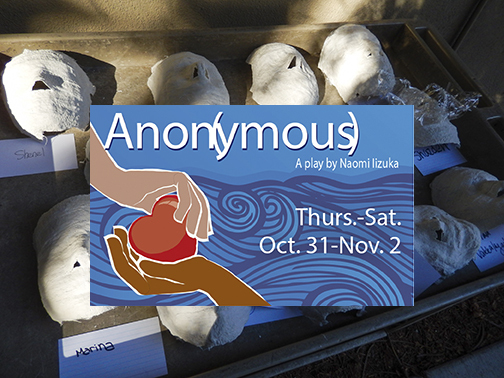 “Anon(ymous),” by Naomi Iizuka, plays Thurs., Oct. 31 through Sat., Nov. 2 at the Blackford Theater.